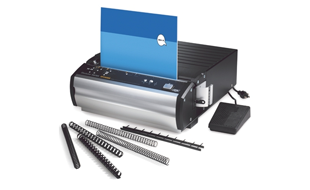 This heavy-duty punch can handle up to 16,000 sheets an hour and is quiet enough to use in office environments. Binding doesn't get any simpler! The GBC Modular Punch MP2500iX is an interchangeable die punch designed with productivity and versatility in mind. Choose from eight different die sets that easily slide into place without the need of tools or locking levers, to change your punching style. 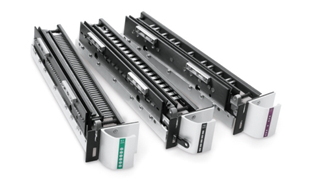 Stack any Modular bind station on top for space saving and one-operator use, or separate for greater productivity. The MP2500ix has a high capacity electric punching capability of 16,000 sheets per hour and the open-ended punch throat utilizes gravity to align various sheet sizes. With any busy office you need a binding machine to be ultra quiet and thanks to the efficient motor the MP2500iX punches so quietly causing fewer disruptions to any work environment than other high volume binding machines. • Up to 16,000 sheets per hour; 1.5 second punch cycle. • Punches books as small as 4". Punches books as large as 11.7" (A4) for all patterns; Open-ended throat design accepts longer sheet sizes in 2 punching passes. Interested in the GBC MP2500iX?